If you are looking for the best fun casino entertainment across the North-West, even all across the UK!..........look no further! Casino Casino Casino provides the best in all forms of fun casino hire / entertainment. 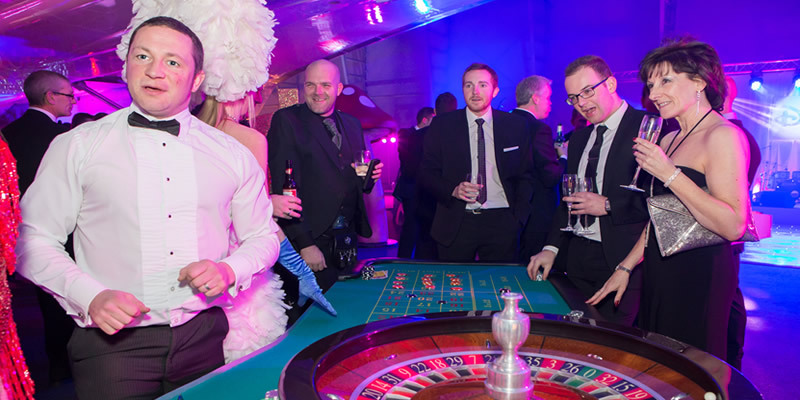 A glamorous evening of fun and laughter for any amount of guests, offering a unique opportunity to raise funds with charity casinos, teambuild with a great corporate or christmas fun casino, or simply great entertainment for any personal event. We have a wide range of differently sized tables ranging from 3/4 size up to full sized tables (as seen in a casino). Our casino tables include professional croupiers and fun money and background music can be provided adding to the atmosphere. Our team can arrange full theme nights such as James Bond or Las Vegas. We have huge and comprehensive theme night packages with as much or as little customisation as you require. Please see our theming page for more detail. Table magicians, vocalists and instumentalists can also be provided! - Brand new for 2015, LED Casino tables perfect for adding some bling to your event.